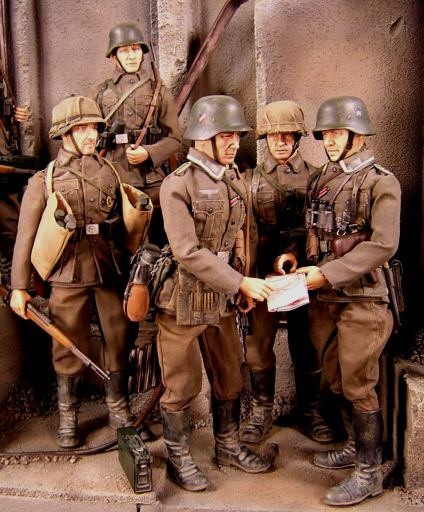 This dio represents a group of men from second company first Bat<?xml:namespace prefix = st1 ns = "urn:schemas-microsoft-com:office:smarttags" />allion / Panzergrenadier-Regiment 21, of the 24th Panzer Division as they coordinate the next attack towards the Volga, amongst the rubble of one of the structures in the Barrikady Industrial Complex. 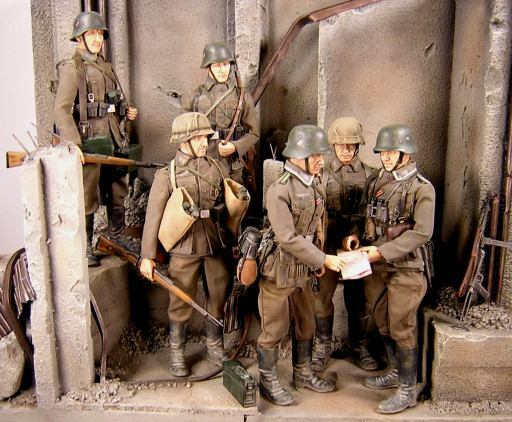 The dio was inspired by a photograph on page 117 of “Campaigns of World War II; The Eastern Front: Barbarossa, Stalingrad, Kursk and Berlin, 1941-1945” by Duncan Andersdon, Lloyd Clark and Stephen Walsh, publised by MBI Publishing Company. Above text is from the same book. 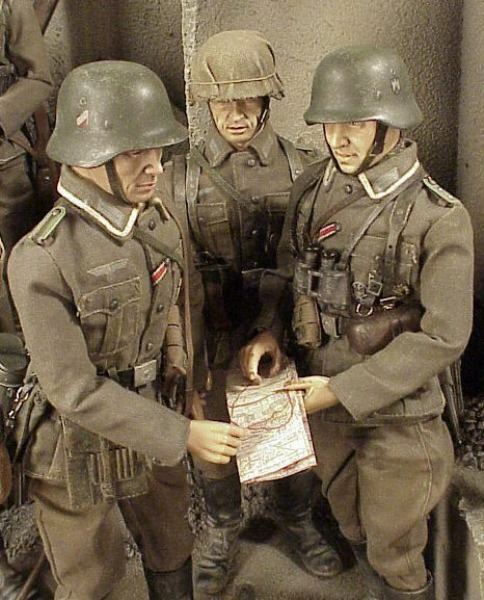 The Oberwachmeister (cavalry rank equivalent to Oberfeldwebel, retained from when the 24th Pz Div was the 1st Cavalry Division), a member of the Company’s HQ section is coordinating the attack and is giving final instructions to the Unteroffizier who is platoon commander. 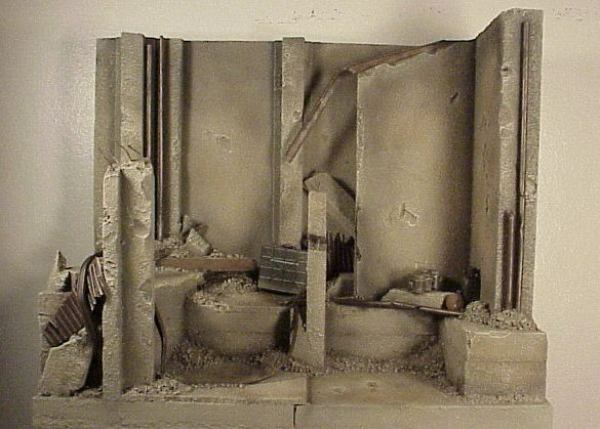 Dio base is made with pieces of styrofoam glued together with carpenter’s glue and held in place with wood screws, a tecnique I developed making model railroad scenery. Spackled the bolt holes in the foam. I used a new technique to treat the foam before painting. I <?xml:namespace prefix = st1 ns = "urn:schemas-microsoft-com:office:smarttags" />always used spackling compound, this time I painted the foam with carpenter’s glue to which I added fine ballast material from Woodland Scenics. I added damage marks to the walls, floor etc. I then added a couple of I- beams, some styrene tubes and one bigger metal tube to make the area appear as some sort of industrial complex that had been bombed. The image that inspired this scene had a brick building, which would have beet better, but I have not been able to represent bricks in a way they look sharp enough o use in a 1/6 dio. The material available from the 1/12 scales doll houses is just too small. So I went with a representation of damaged re-enforced concrete. I added small piles or rubble throughout. Added a piece of balsa wood to represent a fallen beam and some more “pipes” made of thin metal to which I added some damage. I made the rubble with some small pebbles and sand I have saved, got it from the side of the road, great place to find material for modeling jobs. I pass the stuff through a sieve and save the thinner pieces in a bag and the corase part in another. I would fix the rubble in p lace with carpenter’s glue and then add diluted carpenter’s glue over it , then adding some of the thin ballast material. I kept doing this in laters for several days. Added the steel bars to a couple of damaged columns, these are thich florist wire. Also added some foam pieces to represent fallen beams or columns which I had painted with the glue and ballast mixture. I had thought of adding the beams and pipes after painting and finish these separate, but decided against it to have these pieces blend into the dio in a more natural way. I made a large batch of grey mixture, mixing Black:White:Flat Earth (1:5:1 all Tamiya Acrylic paints, actual colors shown in capital letters) . I kept adding details to the base and then started to paint it. Thought it would go faster by using the airbrush, eventhough my air brushes only shoot a relatively small area (about 1 Â½”) it went along relatively at a good pace. I also painted the tubes and I-beams, I always want to get rid of any white color as soon as possible. I would pain these items later. 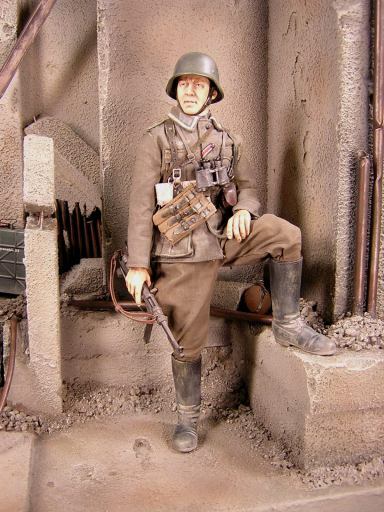 I’m not very experienced with the airgun, prefering to use dry brushing instead to create many of the airbrush effects. But this time around I wanted to use the air gun for the weathering of the dio base. I added Black to the base mixture and went over the pipes and I-beams and also sprayed the corners and rubble piles. Also sparayed some of the black on some areas of the walls. I then got another bottle with a mixture of Buff and White and sprayed it here and there. I also sparayed Flat Earth in assorted areas and kept switching from the almost black mix and the very light buff mixture, until I was satisfied with the results. I let all this dry briefly and then went over the base, dry-brushing with the original base color using a very large brush (almost 2”). I lightened this mix with Buff and White and kept dry-brushing over the piece, bringing the texture out nicely. I then painted the beams and pipes with a mixture of Red Brown and Black, making a very dark brown color which would be the base for all these pieces, including some corrugated styrene pieces that I detailed separately. On this base I dry brushed ( Â½” brush) with a mixture of the base color and Chrome Silver. Added Hull Red and yellow to the mixture in a sort of metal and rust palette of Yellow, a mixture of Yellow and Hull Red, Hull Red, my base dark red brown and Chrome Silver. I then made a diluted mix of light brown and used as a stain on the balsa “beam”. I aded some of the same mixture all over the dio, on the rubble, on the nook and cranies.I then went over the same areas with a lighter mixture of the base color. Always like adding a bit of brownish tint to the grey color if it is to represent concrete or masonry. Pure gray just does not look right to me. Recent issue Dragon tunics and trousers. 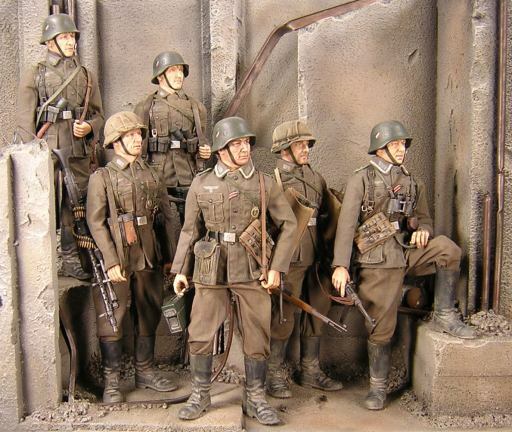 NCO tunics are from Alfons and the EM tunics are from Albert. They represent early tunics with pleated pockets. 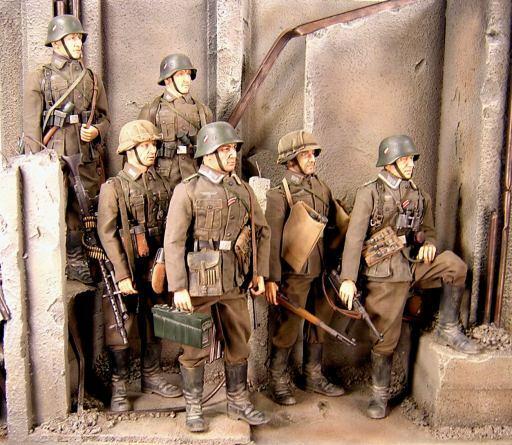 Waffenfarbe is grass green to represent the Panzergrenadiers. all were washed with acrylic washes.